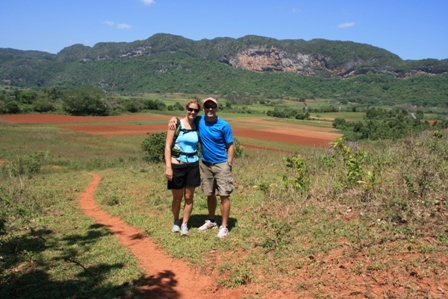 Vinales was a bit of a bonus trip, we didn´t originally think we would have time to get to this end of the country. 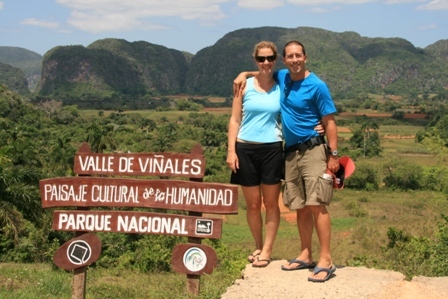 Vinales Valley is yet another UNESCO site! 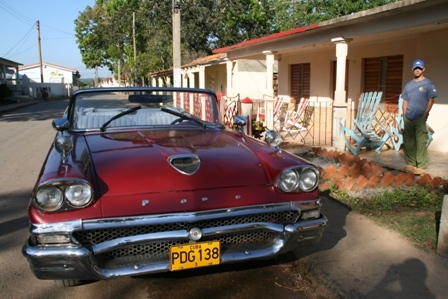 Cuba has 8 of them. 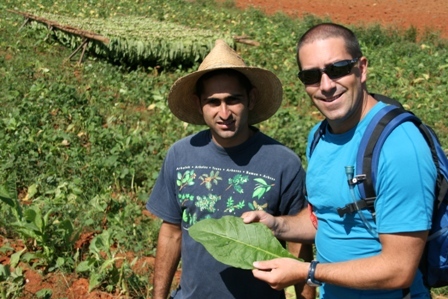 Tobacco is the word on everyones lips here, it is grown, dried, and rolled here. Guys selling cigars pop out of the bushes offering home rolled Cohibas. They are quite determined! The landscape here is quite unique – it consists of flat fertile land surrounded by strange hills called Mogotes, as per the photo below. Don´t ask me about the geology! Don´t think we need introducing at this stage! The town is of the one-horse variety, easy to walk around. Tourists abound, as do local touts offering taxis, horse treks, etc. 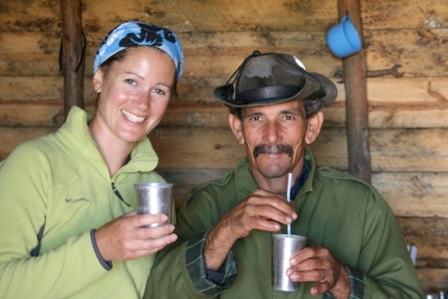 We took a hike through the valley with our guide Brunseci. His English wasn´t so good, but we all managed with a sort of Spanglish! He took us through the tobacco fields, where farmers (campesinos) were tilling the red earth using oxen-drawn ploughs. The tobacco is firstly laid out to dry in the fields, then in barns. 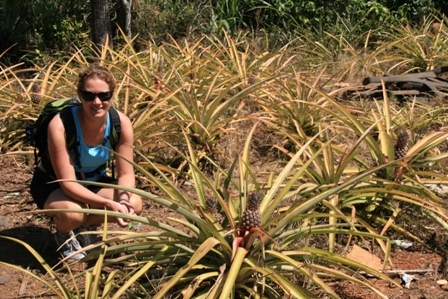 Everything grows so well here – sweet potato, mango, coffee, corn, sugar cane, tomatoes. He took us to meet a campesino-bar keeper guy, who made us rum, sugar cane and grapefruit cocktails and rolled a couple of cigars to smoke! 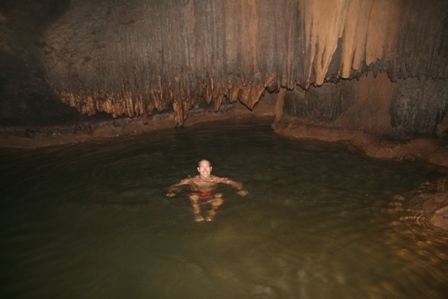 Part of the walk included a swim in a cave. We were led inside in almost complete darkness, save for a couple of weak lights the guides were carrying. It was worth it for the swim under the stalactites. 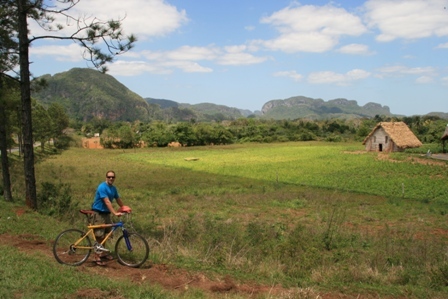 We got a bit lazy for the rest of our time in Vinales. My birthday (Jane that is!) 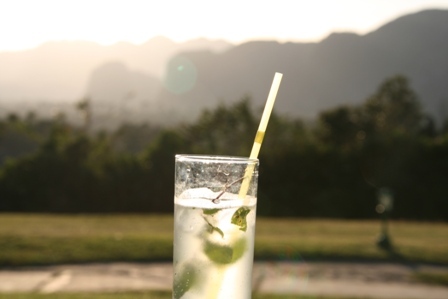 was spent chilling out by a pool at La Ermita hotel, drinking cocktails not unlike the one below! The family we were staying organised a cake and some sweet wine. It was so nice of them, I tried to thank them with my terrible Spanish! We enjoyed local music at the Casa de la Cultura (the only place in town – socialism at its best), followed by a local comedian who hauled me up on stage as the birthday girl (thanks Cathal!). He had everyone crying laughing in the audience with his obviously hilarious witticisms, but I was left in the dark altogether! 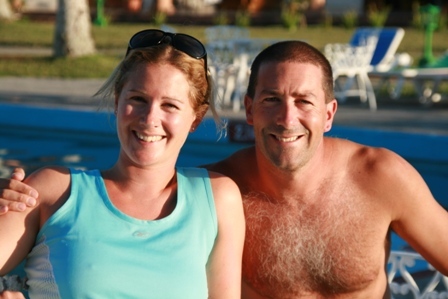 On our last day in Vinales we attempted a cycle, but didn´t get very far as the bikes were not the best…so we gave in and enjoyed the afternoon at the pool. 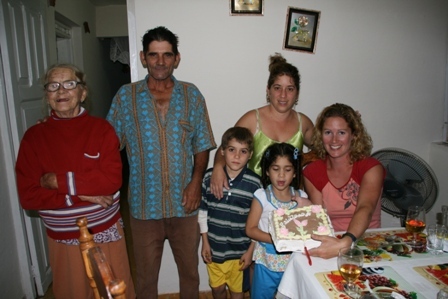 The family we were staying with were sorry to see us go, there is a lot of competition in Vinales, and it can be difficult to win tourists. The government make the casa owners pay hefty taxes each month regardless of the amount of business they get, so for this family I think it was a bit difficult. Happy Belated Birthday Jane. That was nice of the family you were staying to organise a cake for you. 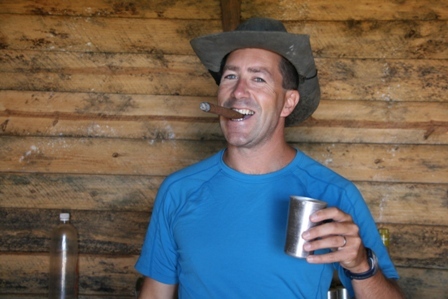 Great picture of you Cathal with the cigar in your mouth. You both are obviously having a ball.